There are dozens of options available in the world of overhead cranes, many of which serve a specific purpose for a specific operation. One of those options is whether your crane’s end trucks will travel on top of the crane runway or on the bottom flange of the crane runway. 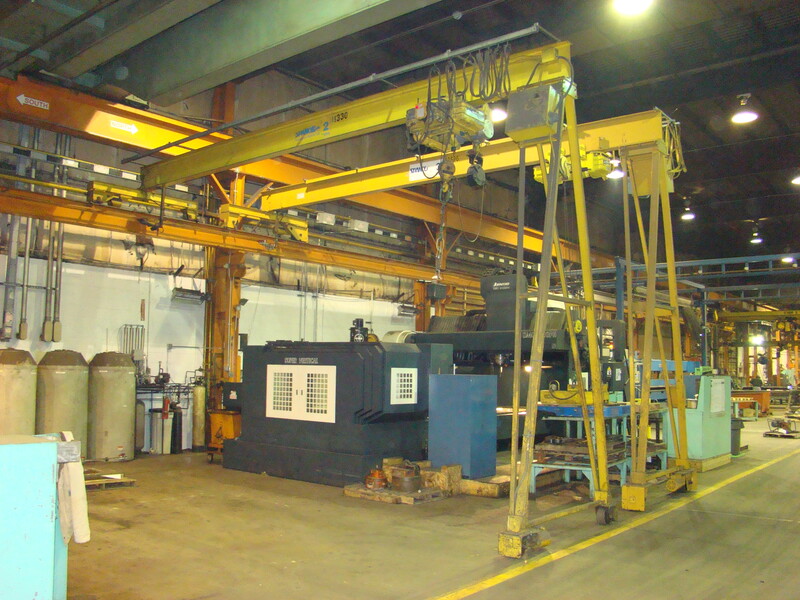 We’re going to take a look at the distinct advantages of using an under-hung overhead crane system, and how it differs from a top-running system. Under-hung or under-running cranes are designed for flexibility and functionality. While top-running cranes are designed to lift massive loads, under-hung cranes provide an ergonomic design that offers versatility and usability. An under-hung crane can be suspended directly from the overhead building structure without the need for interfering support columns. That’s because the under-hung crane system is generally much lighter than the top-running system. For an under-hung or under-running system, the end trucks operate on the lower flange of the runway beams. The beams make up the crane runway. For top-running systems, the end trucks are supported on rails, which are attached to the top of the crane runway. Even in very wide bays, a long under-running crane can easily operate using multiple runways to minimize the depth of the bridge girder and, consequentially, decrease the weight of the operating equipment. This results in lower equipment costs and lighter design requirements in the building or supporting structure. Another major advantage to using an under-hung crane system is their ability to operate side-by-side without interfering with one another or the overall operation. In wide bays, multiple under-hung crane runways can be installed adjacent to one another and operate simultaneously. They also have the ability to pass each other on independent runways. Top-running crane systems can’t accomplish the same multiple service set-up unless they’re supported with auxiliary columns or with gantry legs. Auxiliary columns and gantry legs both interfere with operations and cause floor obstructions that can lower productivity and efficiency. 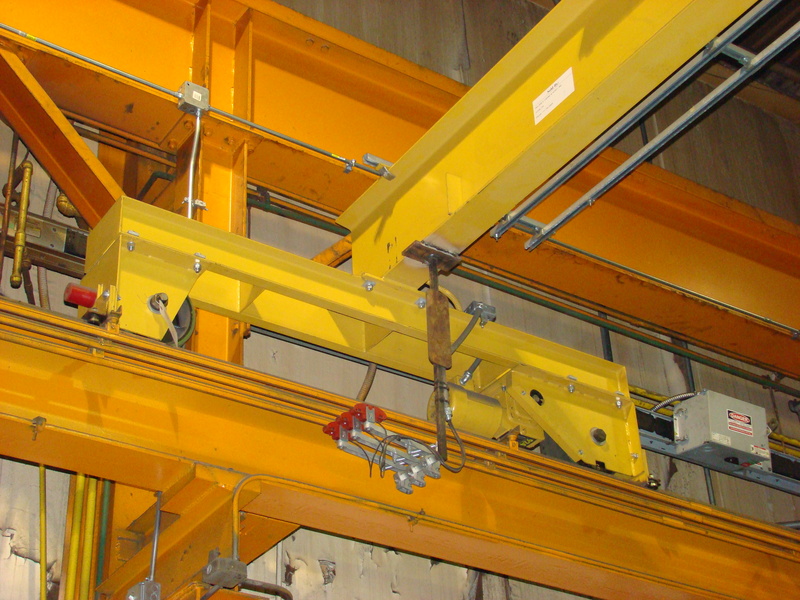 Another benefit of installing under-hung crane systems is the use of interlock mechanisms and switches. Interlocks are mechanical devices that lock the adjacent ends of two cranes together to enable the transfer of carriers from one crane or track to another. An interlocking crane is a system that uses the interlock mechanism on one or both ends. 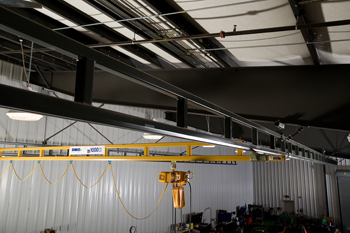 Using multiple interconnected overhead crane systems eliminates the need for load re-handling, effectively lowering material handling equipment costs. Using an interlock device to connect two crane systems is much easier and more cost effective than purchasing and installing one massive system. Interlocks can be strategically placed to turn multiple ceiling-mounted systems into one fluid material handling solution that runs the course of your entire facility. Interlock devices also improve productivity and efficiency, because using one fluid system creates less downtime and can even eliminate the need for auxiliary lift equipment. Under-running ceiling-mounted monorail and bridge crane systems are particularly ideal for production processes that require lifting and transporting materials along a fixed path. If under-hung, these systems can be easily interconnected using the interlock mechanism. And, with these kinds of systems, track switches offer even more flexibility. Track switches are devices with a moving section of track that can be used in multiple locations to permit the passage of a carrier from incoming fixed tracks to outgoing fixed tracks. Track switches are unique to under-hung bridge cranes and monorail systems because they enable the transfer of the loaded hoist and trolley from one beam to another. Using these switches, ceiling-mounted bridge cranes or monorail systems can be used to transfer a load from one bridge to another, from a bridge to a single spur, or to multiple monorail spurs. Under-hung monorail systems provide great layout flexibility with the use of curves, slopes, multiple tracks, switches to multiple spurs, turntables, interlocks, and entry/exit sections. These systems easily connect to one another or to other types of systems such as conveyors or workstation bridge cranes. Top-running systems, on the other hand, are useful for applications requiring the lift and transfer of very heavy loads. If your application requires you to lift loads that are 20 tons or more, using a top-running system makes sense. They are designed for heavy lifting rather than ease of use and flexibility. Top running cranes actually require the use of a bracket attached to the building support steel—or independent support columns for heavier capacities. If your loads are 20 tons or less, using a lighter and more flexible under-running crane system is usually the best option. A top-running configuration can also be beneficial when extremely high headroom is necessary or when the facility has issues with low headroom. Because a top-running system travels above the overhead runway, it allows for additional headroom. A double girder top-running crane system actually offers the most overhead space possible for facilities where it’s a major concern. Even so, most facilities with overhead space concerns can simply use an under-running configuration with a double or single girder bridge crane, without having to install a top-running system. 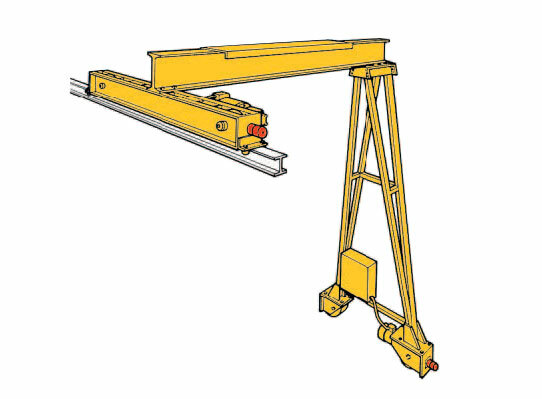 Another type of overhead crane that utilizes both the top-running and under-hung crane configuration is the single-leg gantry crane. Single-leg gantries are a great material handling solution because they provide coverage in plants that can’t fit a double leg PF Series Gantry due to narrow, confined spaces or crowded machinery. 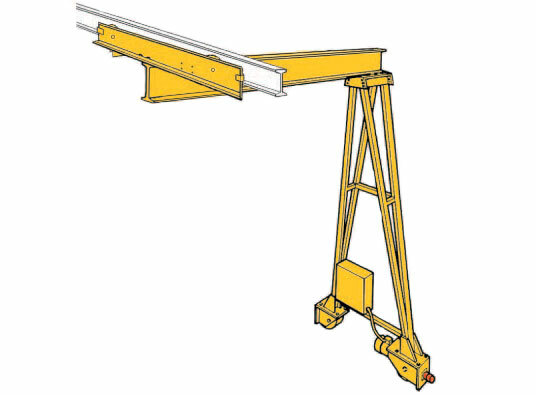 A single leg gantry crane—often referred to as a semi-gantry—is an overhead crane with one leg that runs on the floor on polyurethane wheels, while the other end runs overhead on a wall-mounted I-beam. The end that runs overhead is mounted onto an end truck that travels on either the topside of the runway beam or on the bottom flange of the runway beam. Which side of the runway beam it travels on depends on whether it’s a top-running configuration or under-hung configuration. Semi-gantries utilize two motors: one to drive the wheels along the floor and another for the overhead track. Unlike monorail and bridge crane systems, most semi-gantries are top-running, Top-running semi-gantries provide increased hook height and—like monorail and bridge crane systems—they also extend headroom because the end trucks sit higher on the runway. For this reason, top-running single-leg gantries are also a great solution to add additional hook coverage under an existing overhead crane.